Amazing Weekend for Comeragh Youths in Donegal. 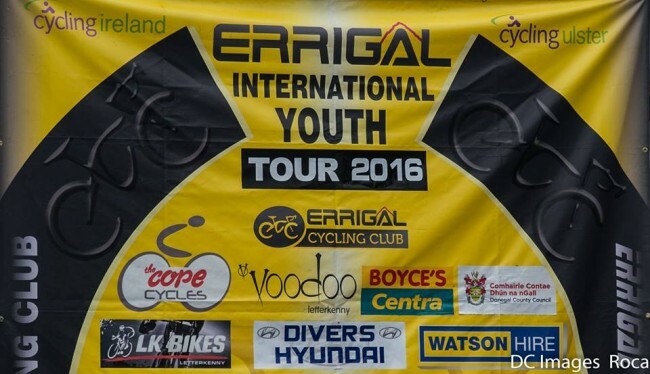 Bee-stings and nettle-stings, stretched chains and broken frames, intrigue and fatigue… The Errigal International Youth Tour brought all that, and more!! And that was just Team Comeragh. Steven, Luke, Jason, Rhys, Conor, Ciaran Aaron, Evan & Tomas had to endure the worst of what could be thrown at them but they all came out the other side with huge smiles. Massive kudos and more to them. 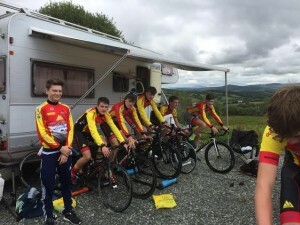 The Errigal Youth tour is without doubt, the most difficult challenge the lads have had to endure so far in their fledgling cycling lives, but they took it in their respective strides. The past winners of the Errigal Youth tour includes such distinguished names as Ian Stannard, Adam Yates and Eddie Dunbarr so the guys knew they’d be up against it. 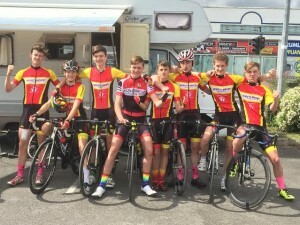 Saturday’s stage one was a hilly 9km loop with Luke & Steven in the Under 14 race doing 3 laps followed by the rest of the lads who were in the under 16 race doing 5 laps. The lads fought hard, enduring mechanicals and crashes with the result of the day for Comeragh coming from Steven Crowley who finished a fabulous 7th place in the under 14 race. Steven finishing a fantastic 7th spot on stage 1. Sunday morning began for the lads with the individual time trial over 3.7km in which all the lads faired well. Sunday’s afternoon stage 3 (which had to be understandably delayed due to a funeral which was taking place in the local of Church Hill where the start-finish was situated.) was a similar distance to stage 1 with again a 9km loop again with under 14’s doing 3 and the under 16’s doing 5 laps. Included in each lap was a gruelling Keeloges hill. A 1.5km climb at an average of 6%, topping out at over 15%. The crowds lined the climb and cheered each and every rider, over it, lap after lap. All the Comeragh riders made good accounts of themselves despite, or even in-spite of the challenges they endured. Some were seriously fatigued and required some medical attention from the, always on hand, medics from the Letterkenny branch of the Order-of-Malta. Ciaran endured a number of crashes while Conor was unfortunate enough to come down and end up in a bunch of nettles. Tired, hungry, battered and bruised it was gone 8.30pm before the under 16 race was over. 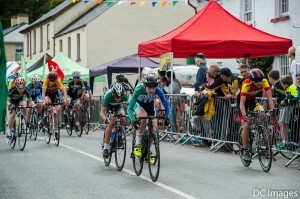 After two extremely long days around Churchill, Monday’s criterium took place in the town of Letterkenny and with and 8.15am sign on it was an early start following the previous late night, it was the same for all though. 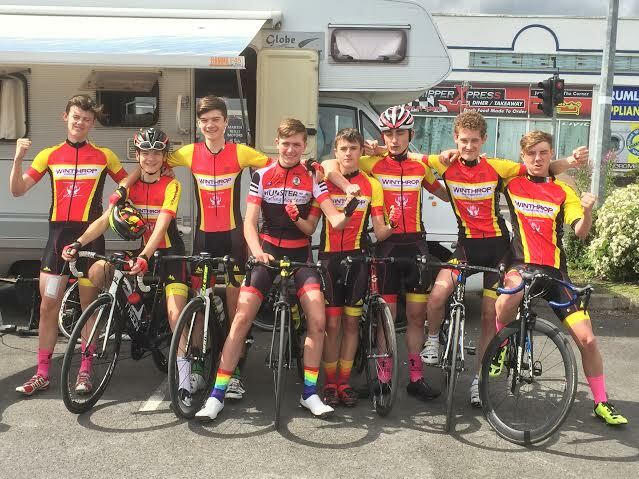 The Under 14’s would do 25 minutes racing plus 5 laps of a tight 1.2km circuit. Neutralised for the first lap, and with 80 or so riders, some felt crashes were inevitable. Steven had the misfortune to get tangled in a crash very early on and the race was briefly halted, after the restart the pace was hectic. Steven and Luke both showed great promise and stuck with it as long as they could, emptying themselves but unfortunately as the race progressed and the commisaires started pulling lapped or nearly lapped riders from the race, first the group Luke was in then later Steven’s group were pulled from the event. 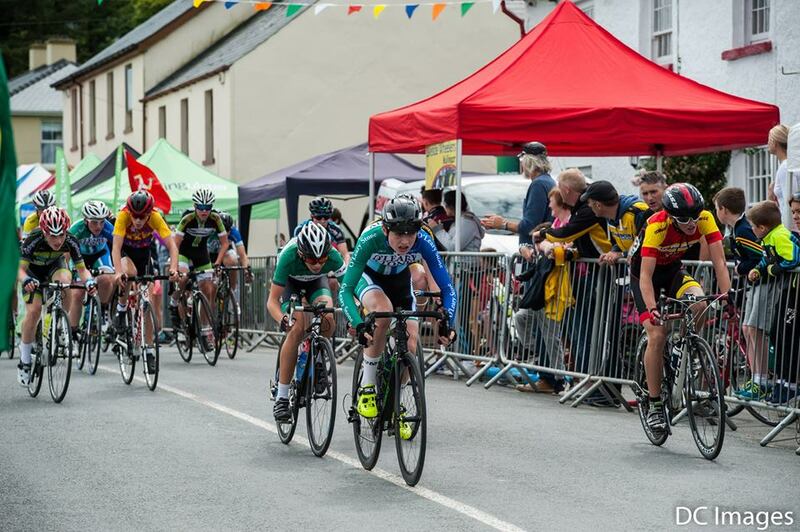 Dungarvan CC’s Mark McGarry had a cracking ride coming home in 2nd place. If the onlookers present of the day thought the under 14 crit was hectic, the under 16 event would surpass that, and then some! Bigger bunch, and faster. A crash on the opening lap un-nerved Aaron and he briefly lost contact but would regain contact with the group Jason was in, but this groupetto would eventually suffer the same fate as the trailling groups in the under 14 race and be pulled from the race, but not before they battled hard to this point. This left Ciaran, Conor, Thomas, Evan and Rhys in the main bunch. 35 minutes plus 5 laps the under 16’s would do and with in or around 60 riders left in the bunch on this very narrow-at-times lap, it’s difficult to say who was more nervous, the riders or spectators. As the final laps ticked down Evan managed to weave his way though the middle of the bunch and as they crossed the line for the penultimate time it was anybody’s game. Over the finish line they went at break-neck speed and us onlookers tried to pick out the Comeragh CC riders, thought we had spotted them all but then heard over the radio that rider no. 23 was down at the last turn, Evan. His frame was broken but his spirit not. Bike over the shoulder, he was determined to bring that bike, with its all-important timing chip, over the finish line. Turned out poor Tomas came down at the same time. 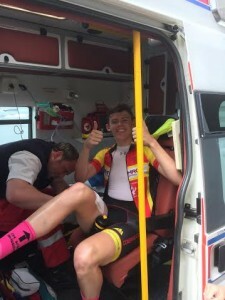 A patch-up for Evan to a few minor cuts, likewise for Tomas. and all could breath a huge sigh of relief. ‘Twas all over. All smiles, despite the damage to body, bike and kit. The team Comeragh lads really showed true-grit this weekend, big pat on the back to ye all, take a wee rest (as they’d say up north) now guys to recover, then back at it for more. Big thanks once again to John Coleman, not only for the great pictures, more of which will be shared on our Facebook page, but also for the seemingly bottomless pit of spare parts he carries.